This is very true; with K-Tel records you had to turn the stereo volume up almost to max in order to make them sound remotely hi-fi, and editing of tracks does become a problem later but everything here, with the exception of a slightly early fade on “Hold Your Head Up,” seems intact. One point to add - I don't think K-Tel albums were ever mid-price, certainly not from the point I started buying them regularly (1976) until the BOGOF Chart Hits 1&2 in '81. I've always felt the groove cramming lends the records an early 70s colour of their own (no tracks were edited on this album, as you say, and weren't until Music Explosion in '74), much like the faded film stock of 1972 that tinged films like The Wicker Man. There's something very comforting about vintage k-tel albums. I recently dusted off my record collection and then got the idea to stream the collection online at http://vinylvoyage.blogspot.com. 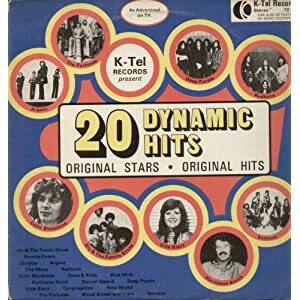 I have a monthly radio program devoted to the playing on one K-tel album in its entirety. The show is called "Adventures in Vinyl" and it's premiere is on February 5, 2011. Check out http://vinylvoyage.blogspot.com for more information. I always took Deep Purple's song "Black Night" to be based entirely on the fake US band from Surrey called Nashville Teens song "Tobacco Road".